Our helpline service is a vital service to family members and friends in Scotland. We will train volunteers in call-handling skills and alcohol and drug awareness. Our helpline volunteers answer calls, online webchats and speak to people in our online community chat room including responding to posts on our message boards on our website. Our helpline runs from 9am-11pm Monday to Friday and we run a call-back service over the weekend. There is flexibility in the hours you can volunteer depending on the demands of our service and your own time. Volunteering for our helpline can be done from the comfort of your own home. Read the volunteer description below for more information. If you are interested in this volunteering role please contact our Helpline Development Officer Suzie Gallagher suzanne@sfad.org.uk who will send you an application form. Fundraising events help us raise money and raise the profile of our charity. 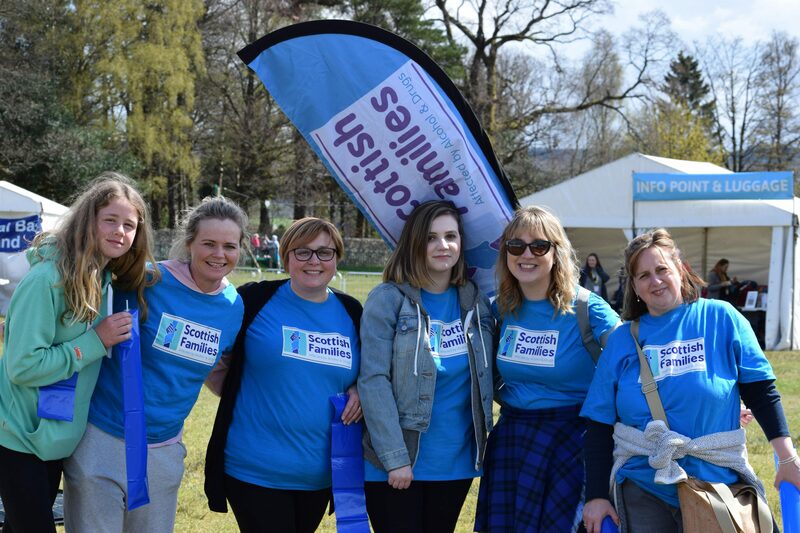 With only one paid member of fundraising staff, volunteer fundraisers make a huge difference to the number of events we can hold and attend, and make a vital contribution. Can you help? Our storyteller volunteers speak to journalists about their experiences of being a family member or friend who is impacted by someone else’s alcohol or drug use. Experiences may include alcohol, drugs, mental health, stigma, recovery, and bereavement. Speaking to the media is an opportunity to raise awareness of the issues family and friends face when someone they care about is using alcohol or drugs. It gives the opportunity to raise these issues to the public and to show what living with someone who uses alcohol and drugs is ‘really like’. It lets families tell their own real-life stories rather than being ‘represented’ by others. Read our Storyteller Volunteer description below and if you are interested fill in an application form and we’ll be in touch as soon as we can. Our media volunteers are involved in our communication activities. The volunteers will mainly write blogs and articles for our website and newsletter. Through our communications, we promote our outcomes that families are: included, supported, recognised and connected to communities. Many of our audiences enjoy reading our content and we would like you to get involved in sharing information to our readers. Social media volunteers – at events, support groups, etc. Community – publicising our work in your local community e.g. hosting events at your university/college/school/work, campaigning, raising awareness, etc. Read our Media Volunteer description below and if you are interested fill in an application form and we’ll be in touch as soon as we can. We collect personal information from you when apply to be one of our volunteers. Full details can be read in our Volunteer Policy Notice.